Koi carp .... 2nd fish drawing. Water color pencils. That is SO lovely! You are a talented person, for sure. Both of your drawings are amazing! Fantastic detail! Looking forward to #3!! I've said it before, Kerby, you do lovely work, and I look forward to seeing some of it in person someday! 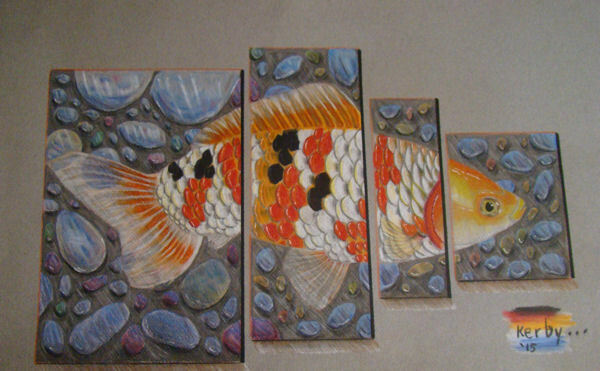 your wonderful drawing of a Koi reminds me of something, maybe an opportunity for a man of your talents/artistry? My sister remodeled her bathroom, and she is a fish "nut". She found some tiles with fish on them, but we were both disapointed in the lack of realism available, and also the considerable cost for tiles we were not overly enthused with. Maybe you would have fun applying your talents to another media, tiles, and have fun with that? Maybe you could find another artist with the necessary kilns etc. to assist? I don't know the answers, but I found recently there is some market for fish pattern tiles and in our case, not that many choices. As always, great work on your part. I love Koi, kept them for years, and they are really a big deal with traditional Japanese and other enthusiasts. I suggest you go to a Koi show, you will have fun, meet wonderfully eccentric people who will likely buy your tiles and paintings etc.